For months, I was torn between No. 01 and No. 04. No. 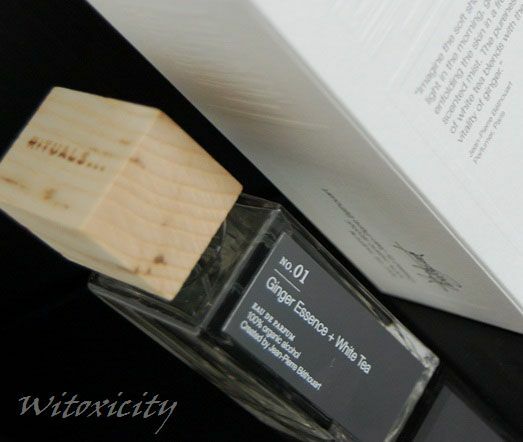 01, which has ginger essence and white tea, is a powdery floral. No. 04, with violets and white lily, was more fruity sweet. I have lost count now how many times I had walked into a Rituals store to spritz, sniff and sometimes fan myself with the perfumes (in some Rituals stores, you can spritz a foldable paper fan with the perfume and fan yourself to take in a whiff of the scent). Crunch time came last month. I couldn't put it off anymore as I was to receive it for my birthday. Well, it's obvious now which one made its way to the cashier. The premise of this brand is to transform everyday routines into little self-pampering rituals. It has looked mostly to the East to learn about ancient traditional rituals such as bathing, washing, massage, grooming and tea drinking, and it then developed products revolving around these rituals. 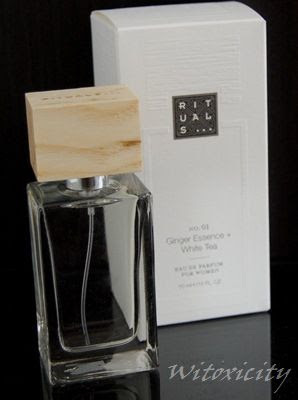 Rituals takes great pride in the fragrances that it infuses in its products and it does say that it has worked with the world's best perfumers. I suppose it's a natural progression for Rituals to launch its own line of perfumes, which it did end of 2010. The launching of the perfume line was timed to coincide with its 10th anniversary. Raymond Cloosterman actually started the Rituals brand in 1998 but it was in the year 2000 that the first ever Rituals store was opened (in Amsterdam). The perfume collection consists of five perfumes for women and three for men. They were created by seven different world renowned perfumers (one of them created two - one each for the women's and the men's range). 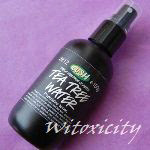 These perfumes are made with natural ingredients and are based on 100% organic alcohol. The box is clean-cut looking in black and white. It isn't immediately obvious but there is embossing on all facets of the box (except the bottom) that outlines the bottle inside. Even the grains of the wooden cap are reflected in the embossing. Clever. The bottle also has a clean silhouette. It does remind one of Dolce & Gabbana's The One. 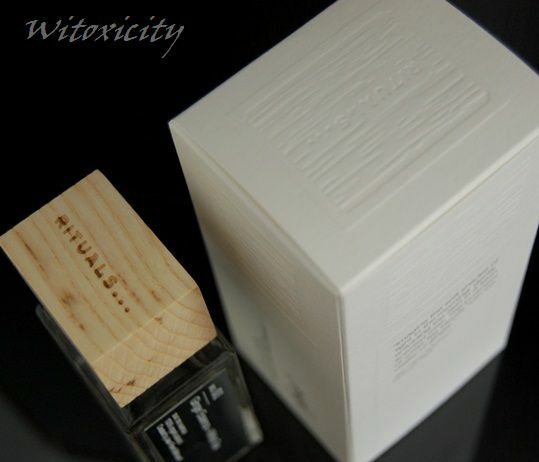 The wooden cap gives it a rustic feel and different perfumes have different wood colours. The addition of a mirrored plate on the side with an engraving of the perfume name adds a nice, sleek touch. Imagine the soft shades of light in the morning, the skin is wrapped into a fresh, transparent and slightly aphrodisiac scented mist. A pure delight of White Tea combined with the powerful character of Ginger. No. 01 opens boldly with an almost spicy kick of ginger, toned down only by the freshness of the white tea. As it evaporates, the ginger turns pleasantly aromatic and gets enveloped in a cloud of floral sweetness. As a whole, it's citrusy. It's like men's after-shave, but feminised. The scent is fresh (thanks to the delicate white tea) but not to the point of being crisp (thanks to the full-bodied ginger). On me, No. 01 dries down to a delicate powdery floral. The sweet ginger undertones never go away. The perfume is moderately lasting. It's probably still there but it's not the kind that I can catch a whiff of at the end of the day. Its sweet freshness makes it something that I would wear in the daytime. So, what made me choose No. 01 over No. 04? Up till the last minute, I was quite sure that I would go for No. 04 as I do tend to fall for sweet, sensual scents. However, I felt that I should try something different this time and to be honest, I love the scent of ginger anyway (and I absolutely love cooking with ginger!). So, No. 01 was my little departure from the norm. I might go for No. 04 the next time. 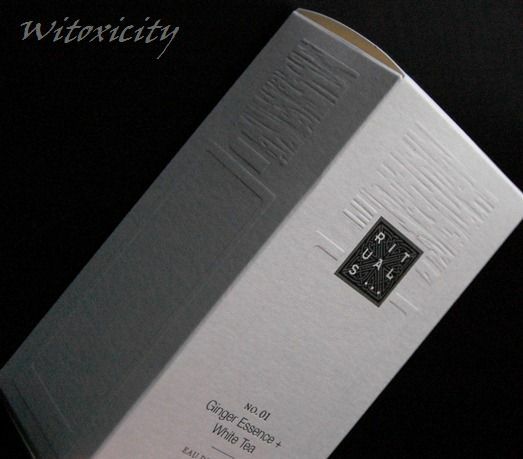 The Rituals Eau de Parfums come in 50ml bottles and they retail for €39.90 each. I think it's hard to review a fragrance if you can't smell it! But you did it really well! Ï love the packaging and the bottle with its wooden cap. Great idea that one can identify the different perfumes by using different caps. The scent of no. 4 sounds interesting too btw.